Some days you just want to cook something that is simple, quick, nutritious and delicious. Something that everybody in the house will eat without complaining! 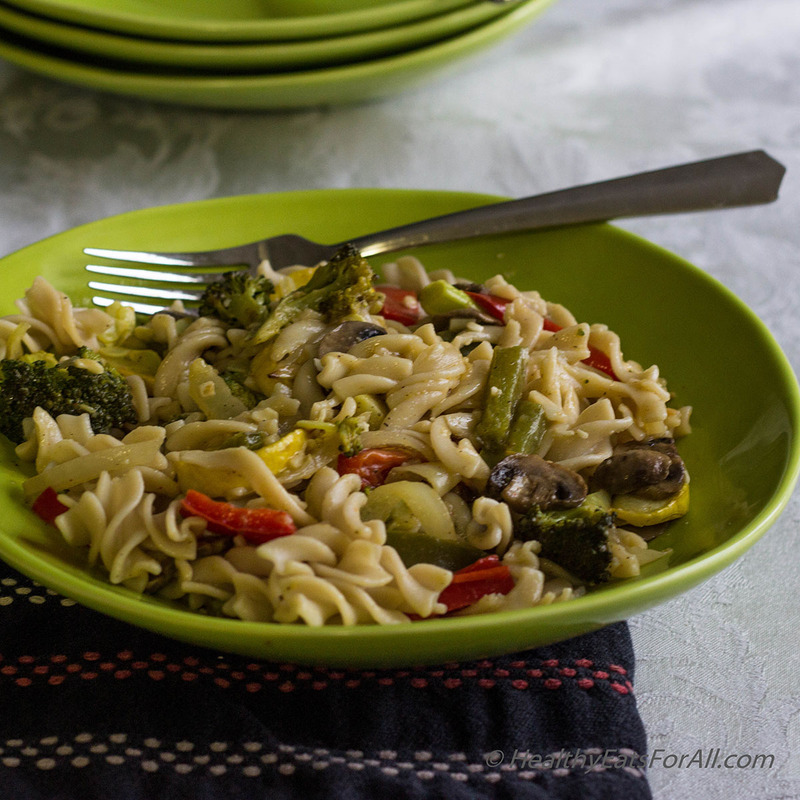 Apart from my usual repertoire of traditional Indian dishes, this pasta dish totally fits the bill. In our household we are trying to reduce how much meat we eat and increase the amount of vegetables we eat. Our goal is to eat vegetarian food about 80% of the time. Research has shown again and again, that not only is that good for our physical and mental health by reducing inflammation in our bodies but also better for the environment. 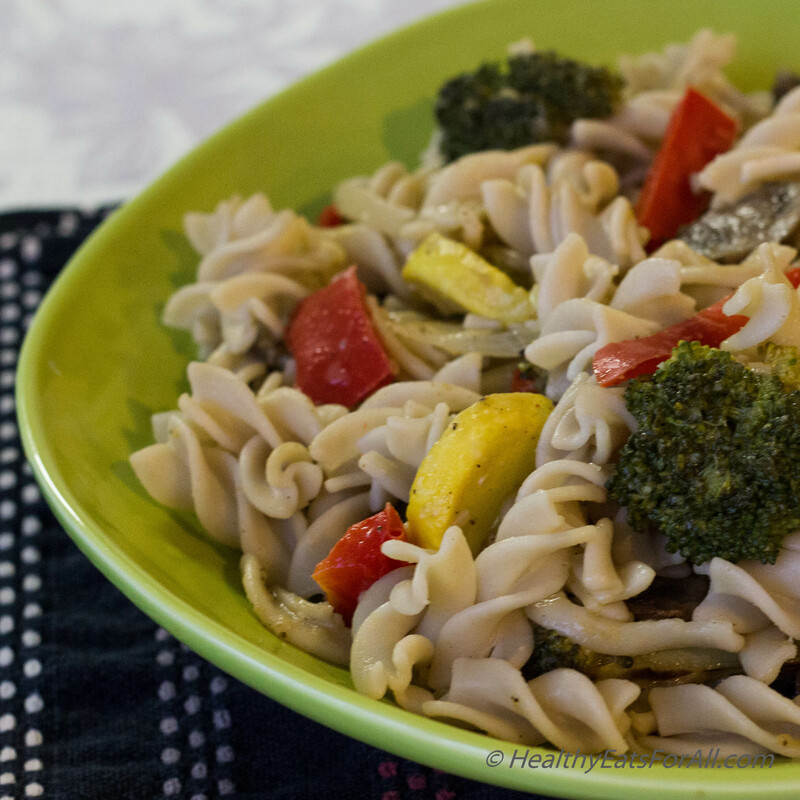 This dish effortlessly adds many brightly colored vegetables to it making it so rich in vitamins. Since there is no tomato sauce in this recipe, it makes it easy for one to taste the individual flavor of each vegetable. 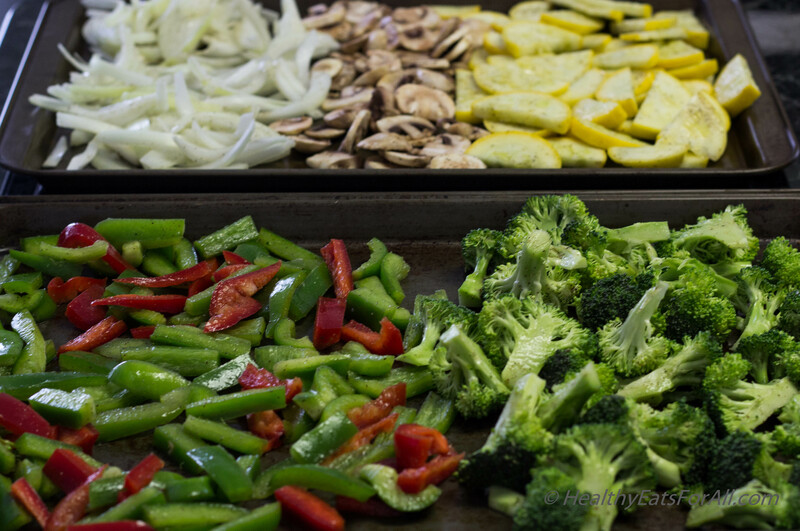 Since we roast the vegetables in the oven, it enhances their flavors even more. Roasting the vegetables makes them slightly sweeter as they get caramelized. I came across this recipe in a book called The Pollan Family Table. It reminded me of a simple chicken dish that I make at home called as Chicken Fettucine. Chicken Fettucine has a similar sauce but instead of vegetables, the chicken is the star of this dish. So when I read the recipe with roasted vegetables, I knew my family would like it as it was very similar to the Chicken Fettucine they loved. All the key flavor of the sauce were similar. I just made a few changes and it was ready to go. I hope you all also enjoy it as we did! Chop the vegetables into similar sizes. Keep the water to boil for the pasta. Add each vegetable separately to a bowl, drizzle some olive oil, salt & pepper and mix well. Use the same bowl for mixing all the vegetables. Place vegetables on a baking tray. Keep the pasta for boiling and place the vegetables in the oven for about 8-10 minutes. By the time the water boils in 10 minutes or so, it will be time to check the vegetables. So go ahead and add the pasta to boiling water. For the vegetables rotate the vegetables so that they don’t get burnt. Keep the broccoli and onions for another 8-10 minutes as they need extra time to cook. The mushrooms and bell peppers might be done in just another 2-3 minutes. 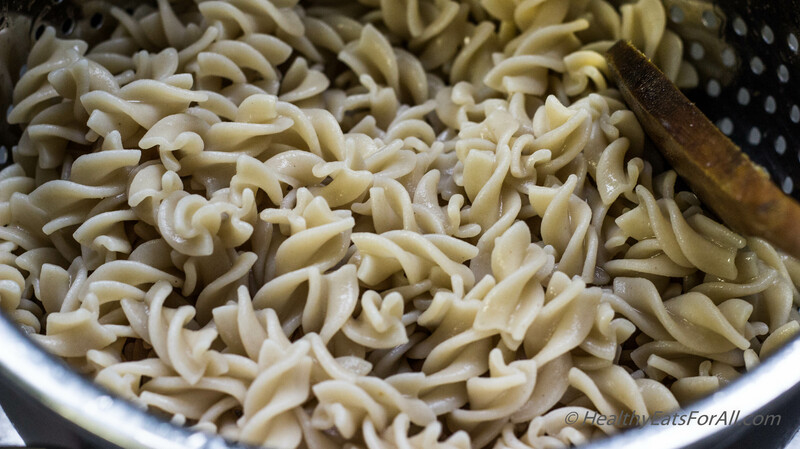 Once the pasta is done al dente, drain pasta but reserve about 1 ½ cup of starchy water. Heat a large pan. Add the 1 Tbs. butter and 1 Tbs. extra virgin olive oil. Then add the minced garlic and cook till slightly browned. Add the vegetable broth and pasta water to give slight thickness to the garlic to make sauce. Let it boil then simmer for 1-2 minutes or so. Add the pasta and vegetables, half the grated parmesan cheese, ½ tsp salt and ½ tsp black pepper. Mix well but gently. Taste for salt. Add the rest of Parmesan cheese for garnish and enjoy! 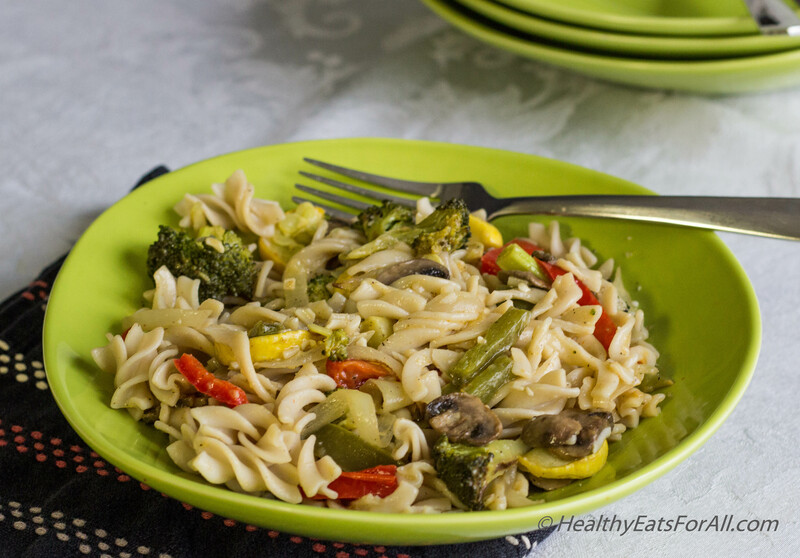 Manpreet I tried this recipe last week and loved the flavor of the baked vegetables in pasta. Is there any reason for mixing the vegetables separately with oil and dry ingredients? Being a lazy person I want to mix all the vegetables together. Will it make difference to the flavor? Thanks for trying the recipe Mickey! Am glad you liked it 😊 The only reason I mixed and baked them separately is because some vegetables bake faster than others. So at the end some will be crisp and some a little mushy if one was to mix and bake together. If in a pinch you can absolutely mix and bake together! There will be no difference in flavor but might be difference in texture. That’s all! Thanks for your feedback. I will try all together today.